Originally published under the title "Russia's Military Presence in Syria." 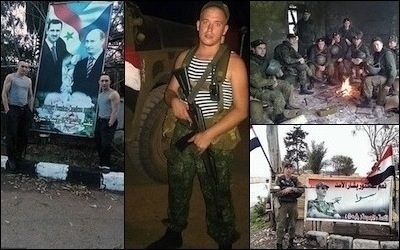 Some of the photos reportedly posted to social media in recent days by Russian soldiers in Syria's Latakia province. The current increase of the Russian military presence in northwest Syria is a function of the declining military fortunes of the Assad regime. It represents a quantitative, rather than qualitative, change in the nature of the Russian engagement in Syria. Moscow's goal throughout the conflict has been to keep Syrian President Bashar Assad in power by all means necessary. The ends remain the same. But as the situation on the ground changes, so the Russian means employed to achieve this goal must change with it. Since the outset of the Syrian civil war, the key problem for Assad has been manpower. Against a Sunni Arab rebellion with a vast pool of potential fighters from Syria's 60 percent Sunni Arab majority and from among foreign volunteers, the regime has been forced to draw ever deeper from a far shallower base. Pro-regime forces have an edge in military equipment, but face dire manpower shortages. At the outset of the conflict, the Syrian Arab Army was on paper a huge force – of 220,000 regular soldiers plus an additional 280,000 reserves. But the vast majority of this army was unusable by the dictator. This is because it consisted overwhelmingly of Sunni conscripts, whose trustworthiness from the regime's point of view was seriously in doubt. Since then, the army has shrunk in size from attrition, desertion and draft dodging. The story of the last four years has been the attempt by Assad and his allies to offset the reality of insufficient manpower for the task at hand. This has been achieved by two means. First, the regime has chosen to retreat from large swathes of the country, in order to be able to more effectively hold the essential areas it has to maintain with its limited numbers. The abandonment of the country's east and north led to the emergence of the areas of control held by Kurdish, Sunni Arab rebel, and later al-Qaida and Islamic State forces in these areas. 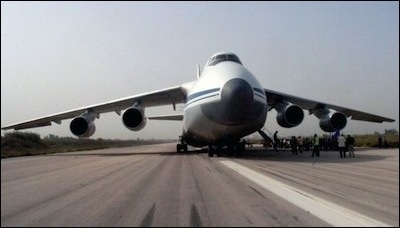 A Russian cargo plane being unloaded an air base in Latakia earlier this month. State media said it contained humanitarian goods. But of course retreating in order to consolidate is a strategy that can be pursued only so far. At a certain point, the area remaining becomes no longer viable for the purpose intended – namely, the preservation of the regime in a form that can guarantee the needs of its Russian and Iranian backers, and the relative security of the ruling elite itself and to a lesser extent of the population which relies on it and upon which it relies. To offset the arrival at this point, Assad and his friends have striven in ever more creative ways to put sufficient men in the field, and to maintain the edge in military equipment which could hold back the masses of the lightly armed rebels. There were the hastily assembled Alawi irregulars of the "shabiha." Then an increasing commitment of Iranian regional assets – including the Lebanese Hezbollah and Iraqi Shi'ite militia forces. Then there was the Iranian-trained National Defense Forces. In recent months, northwest Syria has witnessed the arrival of "volunteers" from as far afield as the Hazara Shi'ite communities of Afghanistan (paid for by Tehran). Despite all this effort, the rebels have, since the spring, been pushing westward toward Latakia province. If the rebels reach Latakia, there is nowhere left to retreat to. The regime and its allies must hold the province or face defeat. The appearance of apparently Russian-crewed BTR-82A APCs on the Latakia battlefield appears to be testimony to Russia's awareness of this – and its willingness to dig deeper for Assad – even if this means the direct deployment of Russian personnel on the battlefield in a limited way. The apparent deployment of a growing force of the Russian army's 810th Independent Marine Brigade at and around the naval depot of Tartus in Latakia province offers further evidence of this commitment, as well as a pointer to the interests in Syria that Moscow regards as vital. The bolder claims of Russian Pchela 1T UAVs and even Sukhoi Su-27 fighter jets over the skies of the Idlib battlefield are not yet confirmed. But the respected Ruslanleviev Russian investigative website found the evidence regarding the APCs and the marines around Tartus to be persuasive. There is a reason why the rebel march toward Latakia cannot simply be absorbed by the regime as a further tactical withdrawal, analogous to earlier retreats from Hasakah, Quneitra, most of Deraa, Aleppo, Idlib and so on. Latakia province is the heartland of the Syrian Alawi community. It is a place where regime supporters have been able to convince themselves for most of the last four years that here, at least, they were safe. If the rebels break through on the al-Ghab Plain, and the front line moves decisively into the populated areas of Latakia, this will be over. The loss of Latakia province would render the hope of keeping a regime enclave intact no longer viable. It will raise the possibility of the regime losing its control of Syria's coastline (vital for Assad's Russian and Iranian backers). Russian marines have been deployed to defend the Tartus naval depot. This, in turn, could mean rebel capture of the Tartus naval depot. Hence the deployment of the marines, who, according to information available, have not yet been placed in forward positions facing the rebels. Rather, they are gathered around Tartus for its defense. So the steady rebel advance in the direction of Latakia is producing a Russian response of a volume and nature not before witnessed on the Syrian battlefield. Russian weaponry and Russian diplomatic support have been the vital lifelines for Assad throughout the last four years. Previous levels of support are no longer enough. So more is being provided. Still, the current indications do not appear to suggest or presage a major conventional deployment of Russian forces. That would go against the known pattern favored by President Vladimir Putin. Russian assistance, while on the increase, is likely to be limited to an active support role. Rather, Russian assistance, while on the increase, is likely to be limited to an active support role, perhaps extending to the use of some air power, along with behind-the-scenes advisory and training roles and the use of some specialized personnel in combat or combat support roles. Meanwhile, as the Russians arrive in Latakia, the rebel mopping up of remaining regime enclaves in Idlib province adjoining Latakia is continuing. A force of the Jaysh al-Fatah (Army of Conquest) this week captured the last remaining regime air base in the province, at Abu Zuhour. Jaysh al-Fatah is a union of the northwest's most powerful rebel groups. Prominent among its components is Jabhat al-Nusra, the Syrian franchise of al-Qaida. This coalition, supported by Turkey and Qatar and armed with advanced weapons by Saudi Arabia, is altering the military landscape of northwest Syria. In the weeks ahead, the fighting in northwest Hama and Latakia provinces looks set to intensify, with the Sunni rebels seeking to push further toward the coast. Assad's benighted regime, aided by its Russian and Iranian friends, will be throwing everything into the effort to stop them. It remains to be seen if the Russian bear's increased pressure on the scales will prove again sufficient to maintain the balance.